I'm excited about it and everything it means to me. This word will not only shape my life but also the direction of my blog, which I've struggled with in the past. It's what I'm about completely (or at least working towards). I spend time reading and researching until something feels right to me. Maybe this is easy for others but for me it takes time. To be deliberate you need to know what you stand for. You can't just follow the crowd and go along with whatever everyone else is doing. You need to examine your beliefs and your patterns and work out what you've picked up along the way and what is authentically you. It's important to know what you're willing to sacrifice and what you're willing to work hard for. What you're willing to let go of and what you're going to hold onto with all of your being. It takes looking at your own values and ethics and what you believe your purpose is in this world and how to align yourself with it all. Being deliberate is a life long journey of discovery, tweaking and adjusting, creating and celebrating your unique self and what you bring to the world that no-one else can. 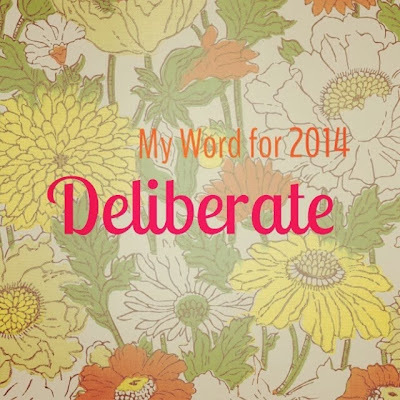 I want to be a deliberate mother...for me this means I treat my children how I would like to be treated. I want them to feel loved, heard and supported. I want to treat them with respect. I want them to believe in themselves and follow their hearts. I want us all to feel connected as a family. I want to continue to work on the example I'm setting as their mother and as a role model. I want to be deliberate in my health...for me this means eating whole foods as close to nature as possible. Being mindful of what I'm consuming including medications and also mindful of what is going on my skin as well. A big challenge for me will be adding in regular exercise into my days. By this time next year I want it to be such a habit that I won't even have to think about it. Of course, this will take a lot of reprogramming to get back in this mindset. I have been there before though, so I know I can do it again. It means taking time to relax and just be. To enjoy nature and meditate. To stretch and move my body. To respect myself. I want to be deliberate in my marriage and relationships...for me this means being mindful of my emotional reactions and working out where they come from and how I can handle it practically. This skill alone has helped me immensely. When we react, we feel that pang in our belly or our chest, even our throat and we often let our emotion fly straight out with accusations and stories of how others are wronging us. I love the quote: "Seek first to understand, then be understood". My goodness it can make the world of difference if we can understand those around us before we try and push our own agenda! It takes practise though. It means loving people unconditionally. It means supporting, encouraging and lifting others up. I want to be deliberate in how I spend my time...for me this means scheduling in what really matters to me and to our family. We do not thrive as a busy, fast paced family. We all enjoy our moments of peace and quiet, but do we ever love a bit of fun and adventure. It will mean being mindful as to what each of us needs at different times. A balancing act, but one that will lead us to our own individual bliss points. Being deliberate will cross every aspect of my life. From growing my garden, creating and managing our budget and finances to simply living our every day life. I will have moments where I fail and fall, I'll be uncertain and undecided, but I'll be sure to pick myself back up again and keep on growing, learning and moving forward. 2014 looks to be an exciting year for our family with the continued building of our home, 3 little boys in school (Louis - Grade 3, Dylan - Grade 1 and Ethan - Prep) and Jayden attending 3yo kinder! I honestly couldn't be more happy and grateful to start off the year as we are. Our life isn't perfect by any stretch, but I will continue to find the joy in the imperfections of it and life lessons in the challenges that we face. Happy 2014 to you all! I hope this year brings you much health, happiness and abundance! Linking up with Maxabella loves for her annual one word linky!